An EBF Maiden Stakes over 5f on good to firm ground. A sizeable field of ten runners, the majority raced and fillies. Star Of Rohm made a great debut at York over 6f. Michael Bell's filly went off an unfancied 25/1 shot but seemed to know her job. This good-looking daughter of Exceed And Excel is a sturdy type who travelled with ease at the furlong pole looking every inch a winner but finished fourth losing by a length. 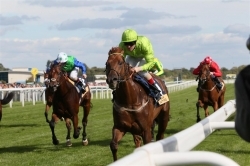 That form has been franked by the effortless win of Artigiano although he may be deserving of greater merit because he was a long way off the lead at York but rallied in the manner of a talented juvenile. However, Star Of Rohm is a worthy favourite. This drop back to 5f shouldn't be an inconvenience although there is a chance her speed will be blunted and she may even be fractionally outpaced mid race. A wide draw isn't ideal as quite often the speed is against the rail. The form of that initial start could well be good enough to take the spoils although there are a couple of issues with this minimum trip and draw. The horse to beat. Body And Soul was well backed on debut at Nottingham and went off favourite ahead of a couple of fair form horses. Clearly connections expected a big run and for much of that race she looked to hold the aces. This daughter of Captain Rio is a big filly with plenty of size and scope. A cheap buy at the yearling sales she may have been but she could be a talent. She showed very good speed on debut leaving the more experience runners struggling to go the pace. In fact at the furlong pole she had the opposition in trouble but tired rapidly in the closing stages to finish sixth. The leaders didn't hold back that day and in such testing conditions you have to consider Easterby's juvenile simply went stride too fast. This faster ground will help and it could take a fast two-year-old to head her over four furlongs. The unknown factor is whether she can hold that pace to the finishing line. To start favourite on debut suggested connections expected a big run but the testing ground may have caught them out. It will take a decent horse to beat Star Of Rohm but Body And Soul could go well and if showing that speed to the line could be a challenger. The David Brown-John Fretwell combination is often a force to be reckoned and this son of Royal Applause was all the rage on debut over course and distance. This bay colt done little wrong that day and looked to be the winner until the late charge of Run Fat Lass Run. He was fancied to go well in a Novice Stakes race at York but in ways was somewhat disappointing. He was unsettled in the stalls and mid race outpaced before running on at the finished when slightly hampered. It was a rather indifferent performance and I considered better would be seen that day. Perhaps Botanic Garden is capable of better but being just under a couple of lengths ahead of Citius could leave him with something to prove. A decent draw and experience will see him well but he may be susceptible to a talented juvenile. Mrs K Burke is one of my favourite trainers and Clock Opera is an interesting runner. This daughter of Excellent Art cost 38,000gns at the yearling sales. She was well backed on debut returning 7/2 but in truth that was a disappointing performance. She was niggled along from the start and looking pressed compared to the rest of the field and then faded in the final furlong finishing last. The owners, Clipper Logistics, have been connected with a number of talented juveniles in their time and it could well be the case this juvenile simply didn't fire that day. One thing is for sure, she needs to find ample improvement to hold any hope of winning this race. The betting is the best guide and if priced 13/2 & less I would expect a big run. Of the others Limit Up has been fancied on both starts but struggles to finish his races and best watched. Money for Bonnie Lesley would be a positive. Conclusion: On form Star Of Rohm looks capable of tying these up in knots. She is a good-looking filly who showed a professional attitude on debut. With Artigiano franking the form in style at Leicester it would seem a tall order to beat this filly. Whether dropping back to 5f will be a problem is a matter for debate. There is a marked difference between the pace of these distances and it is possible she may be outpaced mid race. The positive is that Bell's juvenile will finish with vigour. The draw is not ideal, especially if the speed in down the rail. She wouldn't want to be too far off the pace. The opposition have something to prove with question marks for most. Botanic Garden has shown enough ability to hit the frame and may be better than he seemed at York. He will need to be to win. I have slight concerns he will be outpaced mid race and whether he has the attitude to chase the leaders in the final furlong is the question. Body And Soul is an interesting filly. She is a bit of a brute and has pace to burn. It could be telling that she went off favourite on debut against a couple of fair form horses. The speed she showed to almost go clear at the furlong pole illustrated ability. The testing ground that day may have caught the jockey by surprise. The leaders looked to go a stride too fast and she crumbled in the final furlong which could make her look much worse. Easterby has a fine record at this course and it may well be foolish to write off this youngster after that disappointment. If David Allen presses on she could have most of these on the back foot. The question is whether she can maintain that speed to the finishing line. This faster ground, fitness and experience will be in her favour. One to keep on the right side. It is difficult to know what to make of Clock Opera. The betting will tell the story. If strongly fancied in the betting she has each way claims.